Lipids and volatile compounds of shea butter samples from different African countries (Burkina Faso, Chad, Mali, and Uganda) and different production technologies have been analyzed using an approach based on MALDI-TOF-MS and SPME-GC-MS combined with exploratory multivariate data analysis. By applying MALDI-MS analysis total DAGs were found in the range of 7.6- 22.6% and TAGs in the range of 77.7-92.4% of the shea butter samples. Thereby, major DAGs were found PO (7.3-21.9%), PL (0.0-26.3%), SO (16.3-42.1%), OO (15.1-57.4%), LO (9.1-17.9) and major TAGs were identified POO (2.7-7.8%), POS (4.9-8.3%), SOS (13.8-45.3%), SOO (18.9-39.5%), OOO (1.0-24.3%), AOO (1.4-2.5%) and AOS (1.4-3.7%), respectively. TAG/DAG ratios were found to be dependent on production conditions indicating for inactivation of the lipases by boiling the shea kernels before fat extraction. Volatiles pattern of shea samples detected by headspace-SPME-GC-MS contained more than 100 different compounds, among them many aldehydes, ketones and organic acids. PCA of MALDI data showed a dominating influence of geographic origin on TAG composition characterized mostly by a different saturation degree of the fatty acyl residues declining from West to East Africa. Similar geographic relationships could be visualised by exploratory PLS-DA of the volatiles data. Mainly lipid peroxidation products (in particular unsaturated aldehydes) were identified to be responsible for this sample distribution. Volatile patterns are also influenced by producing methods. For example, methylketones - probably of microbial origin - have been found as marker compounds for "heaping" of the shea kernels before fat extraction. Keywords: Butyrospermum parkii (C.F. Gaertn. ), MALDI-TOF-MS, Partial least squares discriminant analysis (PLS-DA), Principal component analysis (PCA), Shea butter, Triacylglycerols, Vitellaria paradoxa (C.F. Gaertn. ), Volatiles. Affiliation:Department of Pharmaceutical chemistry, Faculty of Life Sciences, University of Vienna, Althanstr. 14 UZAII, A-1090 Vienna, Austria. Keywords:Butyrospermum parkii (C.F. Gaertn. ), MALDI-TOF-MS, Partial least squares discriminant analysis (PLS-DA), Principal component analysis (PCA), Shea butter, Triacylglycerols, Vitellaria paradoxa (C.F. Gaertn. ), Volatiles. Abstract:Lipids and volatile compounds of shea butter samples from different African countries (Burkina Faso, Chad, Mali, and Uganda) and different production technologies have been analyzed using an approach based on MALDI-TOF-MS and SPME-GC-MS combined with exploratory multivariate data analysis. By applying MALDI-MS analysis total DAGs were found in the range of 7.6- 22.6% and TAGs in the range of 77.7-92.4% of the shea butter samples. Thereby, major DAGs were found PO (7.3-21.9%), PL (0.0-26.3%), SO (16.3-42.1%), OO (15.1-57.4%), LO (9.1-17.9) and major TAGs were identified POO (2.7-7.8%), POS (4.9-8.3%), SOS (13.8-45.3%), SOO (18.9-39.5%), OOO (1.0-24.3%), AOO (1.4-2.5%) and AOS (1.4-3.7%), respectively. TAG/DAG ratios were found to be dependent on production conditions indicating for inactivation of the lipases by boiling the shea kernels before fat extraction. 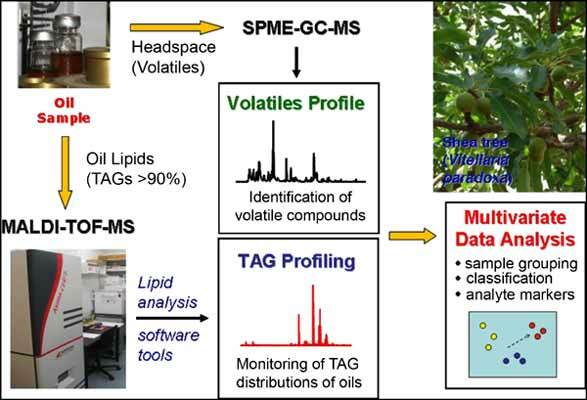 Volatiles pattern of shea samples detected by headspace-SPME-GC-MS contained more than 100 different compounds, among them many aldehydes, ketones and organic acids. PCA of MALDI data showed a dominating influence of geographic origin on TAG composition characterized mostly by a different saturation degree of the fatty acyl residues declining from West to East Africa. Similar geographic relationships could be visualised by exploratory PLS-DA of the volatiles data. Mainly lipid peroxidation products (in particular unsaturated aldehydes) were identified to be responsible for this sample distribution. Volatile patterns are also influenced by producing methods. For example, methylketones - probably of microbial origin - have been found as marker compounds for "heaping" of the shea kernels before fat extraction.